Looking to add powerful STEM resources to your STEM program? Check below for our complete list of STEM tools. The content in STEM Jobs Magazine and at STEMjobs.com engages students with stories of people just like them with amazing jobs in STEM focused on what they are passionate about. 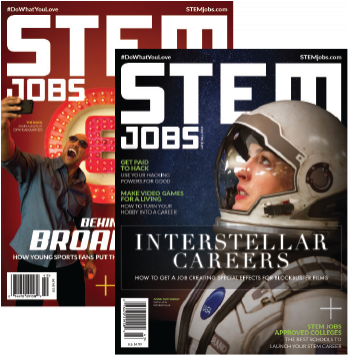 Click below to Find out how you can obtain more STEM Jobs Magazines for your classroom. Each issue of the magazine comes with a set of 5E-model lesson plans that have students experience a “day in the life” of people in amazing STEM fields. All of our lessons are built by MEd and PhD educators and are tied to state and national standards. 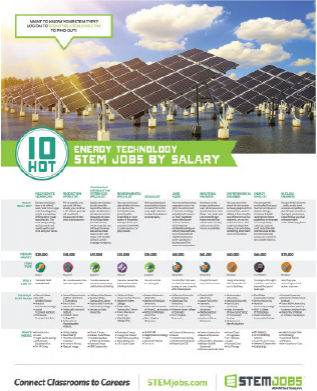 Each issue of the magazine comes with four posters, which feature 10 hot jobs in different industries. Students get to learn what people in those jobs do, what they make, who trains for them and who is hiring. The STEM Jobs Classroom Toolkit combines the best of our education resources into one convenient package that is delivered four times a school year. 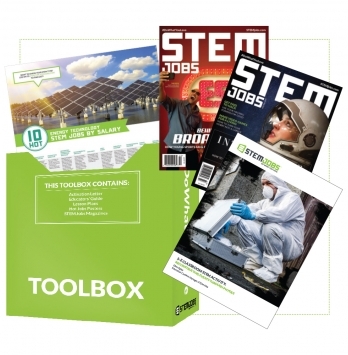 Packed with lesson plans, posters, and a classroom set of magazines, it connects your classroom to careers and gets students excited about STEM in a whole new way.